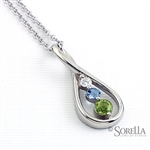 One of the most treasured pieces of jewelry a mother can receive, a Sorella Birthstone Pendant celebrates the birth or adoption of very special children. You design it with birthstones or diamonds, and your choice of precious metals (platinum, palladium, 18k, 14k and 10k, yellow, white and rose gold, and sterling silver) and we will make it beautiful. Many pendants can be added on to as your family grows, creating beautiful family pendants. Give one as a thoughtful gift to the special mothers and grandmothers in your life - or let us create one just for you.